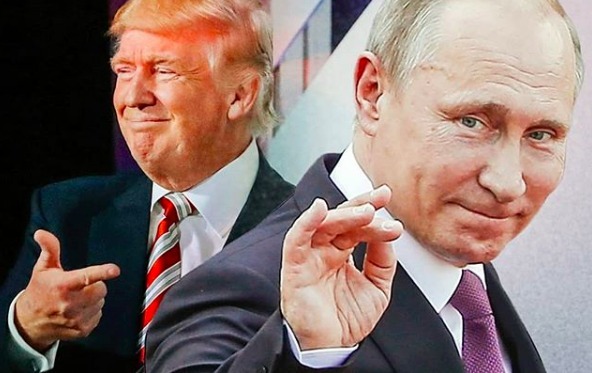 There’s been a lot of chatter this week about Donald Trump’s disastrous joint press conference with Vladimir Putin in Helsinki on Monday, during which Trump claimed he didn’t believe the FBI when it said Russia meddled in the 2016 and instead he was siding with Putin. After a public outcry from both Democrats and Republicans alike over those remarks, Trump held an emergency press conference to walk back everything he had said 24 hours earlier. Yesterday, Trump, who once bragged about using “the best words”, claimed he “misspoke” when he said he didn’t “see any reason why it would be” Russia who meddled in the 2016 election and that what he really meant to say was “I don’t see any reason why it wouldn’t be Russia” who interfered. See the difference? Would versus wouldn’t. It’s an easy mistake to make. Right? Right?! Annnnd we’re back to square one. ?#Trump can’t blame this on #would or #wouldnt. #Treason #CheckTheVideo #TeamDl ? #puppet and #puppetmaster #Trump and #Putin ?? Yes, a very good one! My fave might be the trump “boyfriend” ogling Russia while the USA “girlfriend” can’t believe her eyes. And just when I was getting tired of that boy-with-the-roving-eye meme. If the US had elected a brain-damaged pervert with a bad case of Tourette’s, it really couldn’t be any worse.